Today I want to introduce my favorite cheap hostels in Hong Kong. Why I emphasize the word “cheap”? Because Hong Kong is bloody expensive, especially when it comes down to accommodation. Thus find a decent cheap room may represent a challenge. If can afford an expensive hotel you can head to Agoda.com and book the room you like more instead of keep reading this article. By the way, if you are interested on the topic here you find our guide to find an hotel in Mainland China. It’s one of the cheapest hostels in Hong Kong Island. Sure, you can still stay in Kowloon or New Territories (that is the part of Hong Kong S.A.R. located on the mainland). But Hong Kong Island is the real center of Hong Kong S.A.R. It’s also the place where the best beaches and most of the bars/clubs are (the bar zone is called LKF and is close to Central subway station). You can choose between single or shared rooms and the hostel has a common space where you can gather with the other guests and even sit down, drink some coffee (free from 8 to 10 am) or use your laptop. 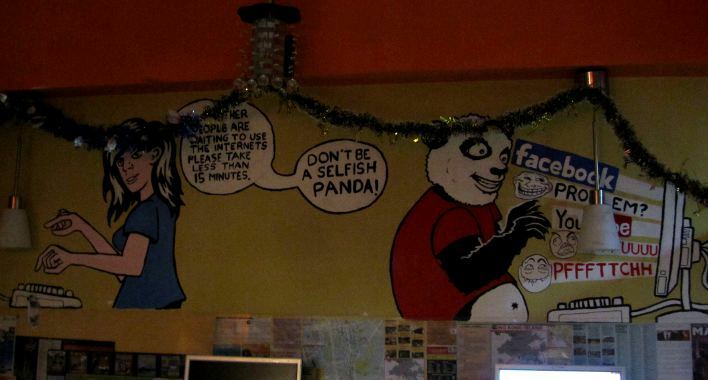 I know this is a normal feature on most of hostels around the world. But hey, this is Hong Kong and if you keep reading you’ll understand why I value so much the common space of this hostel. Room are quite clean and not so small (for Honk Kong standards). The hostel is located in Paterson Street 47 (block A, 3rd floor), that is two minutes away from the exit E of Causeway Bay subway station (just walk out the station, go left and turn left again in Paterson street). Causeway Bay is an awesome neighbor with lots of shopping malls, restaurants and shiny lights. This hostel attracts a lot of backpackers so it may be your best bet if you are traveling alone and would like to meet some funny people to hanging out in LKF (the bars street) or the beach. Here I never fail to meet some interesting people. There is a downside: Internet doesn’t work well on the third floor (that is where the reception and many of the rooms are). You keep losing the connection and it may be frustrating if you aren’t on holiday and would love to get some work done. What you can do is to specify that you want a room at the second floor, where internet is quite fast. p.s. If you aren’t going to book your room on Agoda you may find the same hostel with different names such as “Backpackers Hostel” or whatever. I don’t know the reason but using different names for the same hostel seems to be fairly common in Hong Kong. 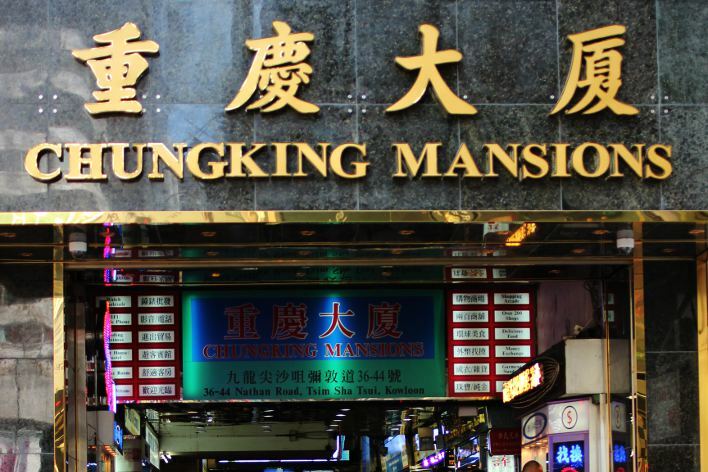 The (in)famous Chung King Mansions are a huge building located in Nathan Road, Kowloon, just in front of the exit D1 of the Tsim Sha Tsui subway station (Red Line). They aren’t really hostels in the sense that they don’t have any common space where you can eat, play cards or socialize with the other travelers and Visa runners. Instead, they are apartments that have been re-adapted into dorms. The owners try to squeeze as many bed as they can on each room so forget about the concept of “space.” Windows? Forget it! Even the reception is just a mini-table at the entry of the main apartment of the so-called hostel. The “main” apartment is the one where the reception of the hostel is. However many of these hostels expanded into several apartments. So don’t be surprised if the receptions is at the 3rd floor while your room is at the 18th floor. Also at the Chung King Mansions is fairly common to find the same hostel with several name. For instance the Crystal Hostel is also called Canadian Hostel (and before was called Korean Hostel). And by the way, both names make no sense at all as they are run by Indian people (as anything connected with Chung King Mansions). My two favorites hostel at Chung King Mansions are Ashoka Hostel (cheap, clean, reliable internet connection, small common space where you can sit down and even prepare your own coffee) and Crystal Hostel, which I like because you can get a single room for the cheapest price in Hong Kong (but prices are dynamics so things may have changed so far). Entering the Chung King Mansion is like being catapulted to India or Pakistan. And the food at the small stands that you can find at the ground floor is awesome. And cheap. The location is quite convenient, especially if you want to stay close to subway station or the Visa agency I recommended on one of my previous articles. As I’ve already said, the hostels located at the Chung King Mansions are usually quite cheap. Also, if you didn’t book a room before you arrive chance there are that you’ll find one at the last moment. I still recommend to book your room before as it’s usually cheaper. As soon as you arrive you’ll be stumble upon a lot of aggressive vendors. The goods they’ll try to sell to you may vary quite a lot: it could be a fake Rolex, a room in a hostel, hashish or a photo camera (I doubt they are real Canon or Nikon though). Even if there are several elevators (I think they are twelve but I don’t recall the details) they are all small and overcrowded. The result is that most of the time you’ll end up waiting several minutes to get into an elevator and then squeezed inside with other eight people that we’ll often carry huge bags or boxes with them. The hostels are super small and the electrical plant is very old. This may cause a lot of noise and sparks when you plug-in your laptop or phone charger. Forget about bringing an host such a girl that you met late at night in LKF. It’s usually forbidden even if you have a single room. I guess they are worried the building will collapse if too many people gather on the same apartment at the same time. What’s your favorite hostel in Hong Kong? I’ve been in and out of Chungking Mansions for many years now. In that time I have seen the immediate aftermath of two murders there. There first one was a large pool of blood on the first floor together with bloody walls to one of the elevators. The second one I saw them bring out bother the body and the murderer in handcuffs. chung king mansion i must say should be your last choice as one said in a previous comment: many dirty food stands and aggresive vendors, when im checking in a hotel i dont want to be harassed by anyone, and be leary of the Indiands they often try to throw you off by jugging your rooms around so you will forget your passport and the picture always look better than the room. Pay attention to your belongings.Note their are many hostels that give greater service than the Chung King mansion. AVOID!